Now that Spring is here, you probably want to trade in your knee-high muck boots for something else. I've always been a big fan of Sloggers, unless it's been raining for days and I'm wading mud puddles. These shoes are not only comfortable, but they are easy on/easy off and have decent support. We have a dowel shoe rack mounted on the wall just outside of the back door that hubby made a few years ago and we keep all of our garden, barn and coop shoes there. These shoes last quite a few seasons and are reasonably priced for a decent working shoe (as long as the dogs don't get to them -- then they become pricey chew-toys). One of the major selling points for me is the "Made in the USA" label. I also keep a second pair in my car for when I visit my cousin to prevent any cross-contamination from my farm to her farm, or vice-versa. Our livestock/flock health is a major concern even though we both have extremely healthy animals. It's always better to be safe than sorry. 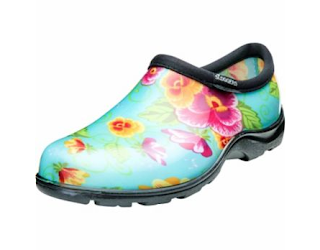 Made in the USA, the slip-on Sloggers Women's Waterproof Comfort Shoe is perfect for working in the garden or running an errand on a rainy day. They are easy to slip on and off and are a breeze to hose off, so you can leave the "Great Outdoors" where it belongs - outside! If you're looking for a good, hard-working shoe for the farm, check these out. If you have a different shoe that works well for your farm needs, share about them in the comments below.